Recently I bought my first skincare product from the brand Dermalogica. I've heard so many good things about this brand that I had to try it out as well. I've tried it out for about two weeks now and I would love to tell you everything about the product and my personal opinion. If you haven't seen last weeks post about my Clarisonic you can visit it here. Let's get right to it! The product that I bought from Dermalogica is called the Matte Moisturizer with spf 15. 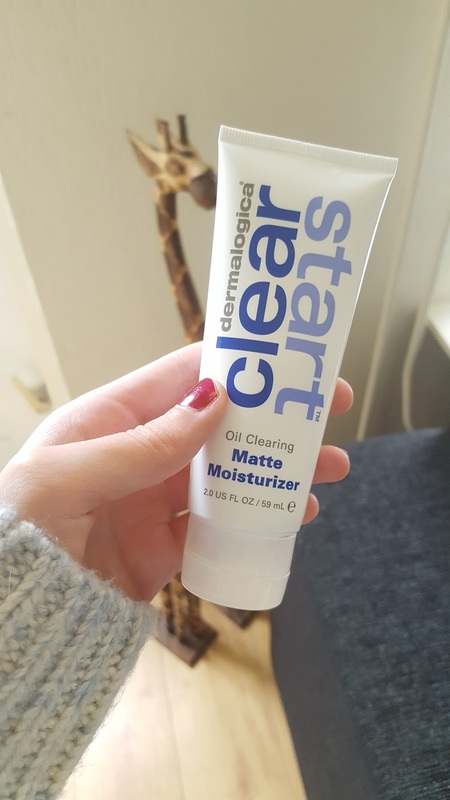 The moisturizer is from the Clear start series and is specifically made for teenager and young adults. This cream is for the oily skin and it's perfect as my skin is very oily in the t-zone. The areas around my nose and cheeks are where it's the worst. I thought why not try this moisturizer and see what it does to my skin. The first time I applied it on my face it felt really nice. After a few minutes I could already feel that my skin felt a lot softer. The matte effect is also visible which makes your skin look really clean and healthy. I have to say I already expected that this product would be great because it's a top brand and Dermalogica is recommended a lot. Until now I've used the moisturizer everyday and the result is still very good. The cream smells also really clean and I love that my skins doesn't look oily anymore after I apply the moisturizer. That was my main goal. The cream has spf 15 so you don't need to apply sunscreen anymore for the winter. Overall I'm really happy that I tried this matte moisturizer from Dermalogica. It's one of my favorite skincare brands right now and I'm definitely going to try out the face wash products from the Dermalogica Clear Start range. I got the moisturizer for 16 euros on the webshop Lookfantastic as they had the product the cheapest. Thank you very much for reading today's post I hope you liked it! Have you ever tried a product from Dermalogica? Seems a promising product! I am looking for a moisturiser for my combination skin.I use The Bosy Shop sea weed range. And it's quite nice. Dermatologica products are expensive as the body shop ones!